I work as a Specialist Nurse in the Rheumatology department at the University Hospitals Bristol NHS Foundation Trust, UK. I have known Shanali since she worked with us during her medical training 2006 - 2007. 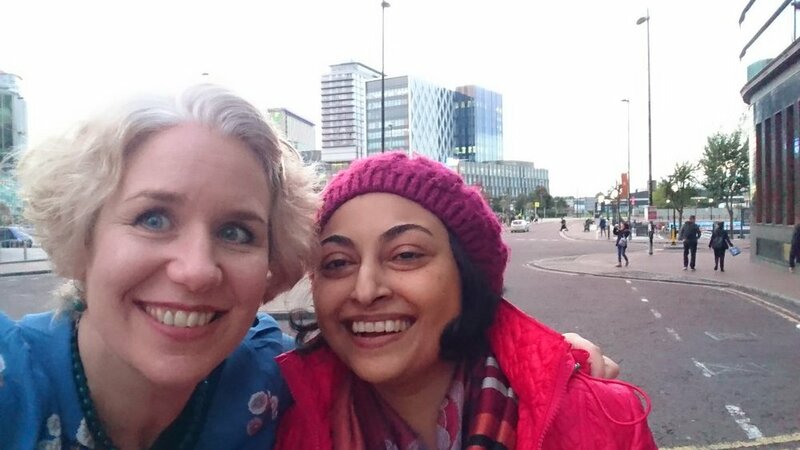 We lost touch for a while but when I met her again at a Rheumatology conference in 2016, I heard her story and saw her work for the first time. I was inspired by her passion for art and intrigued by the part art played in her adaption to, and acceptance of, her condition. We moved into a newly re-furbished Rheumatology Department in December 2016. We needed some artwork for the very plain walls! Various suggestions were put forward by the team but I managed to persuade them the best artwork to use would be Shanali’s. Firstly, because it is full of life and colour. Secondly, I wanted it to inspire patients. It is so much more meaningful for them to enjoy it visually and then hear the story of who the artist is. If someone like them can be this creative – perhaps they can too?! 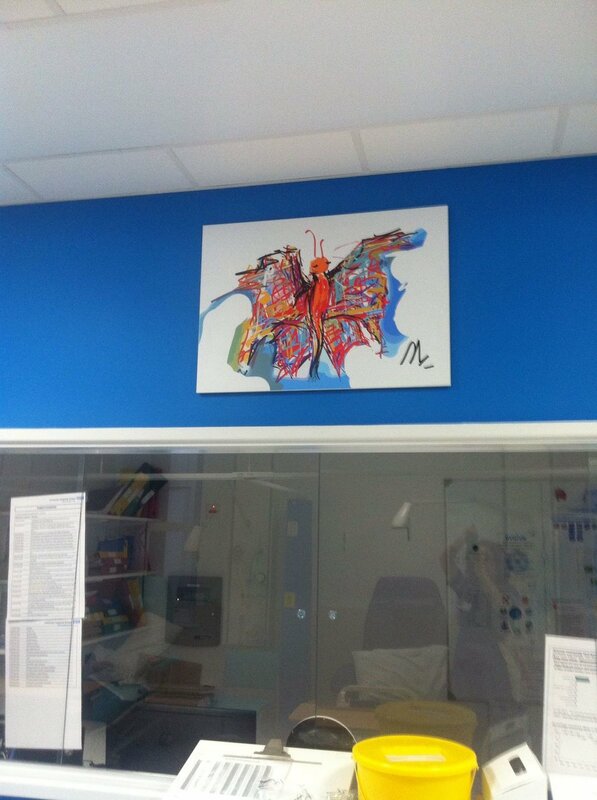 Her art is in the waiting area, DXA scanning room, corridors and day unit infusion area. 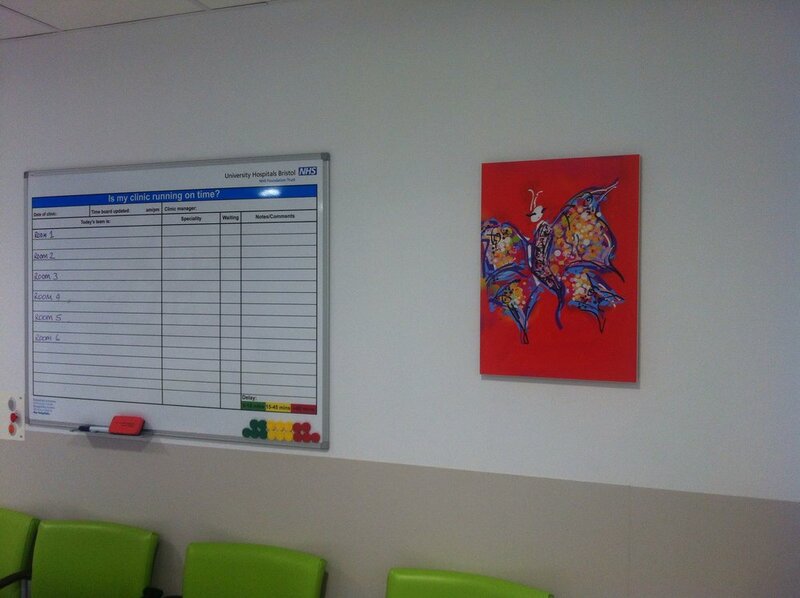 The main impact is from the art in the day unit where patients come regularly for infusions. Her work has prompted much discussion and is often admired. We tell them ‘her story’ and I hope this gets them thinking about how art could be a part of their life (in whatever form). The day unit was too ‘clinical’ when we first moved in, patients commented on how cold and unwelcoming it felt. 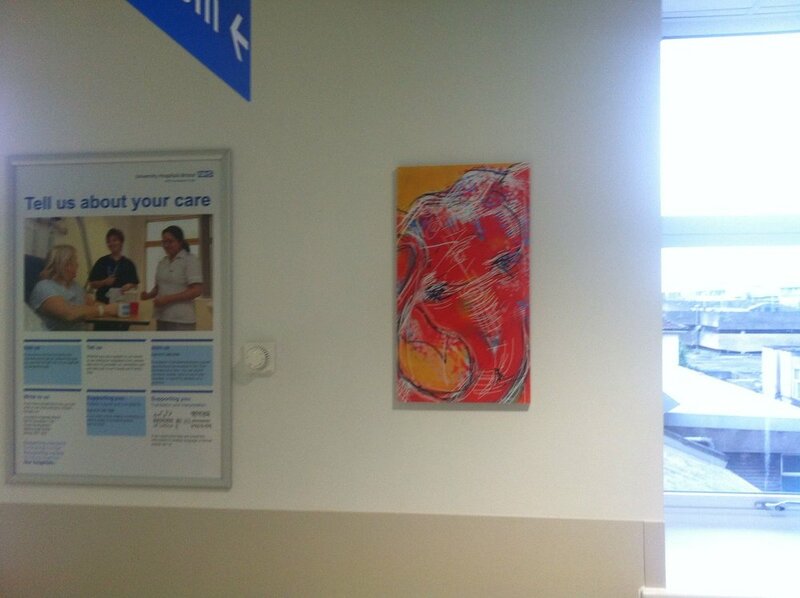 The two pieces now adorn the wall patients face (when in the infusion chairs). I believe the impact of the colours and fun images are soothing and uplifting in a spiritual way. I myself often spend time looking at them – even a glance as I walk down the corridor makes me smile when I think of Shanali – her strength and her story inspires me when I am feeling exhausted. I aim to have leaflets holders on the walls under the pictures for patients to read about her work (we currently give them out on request). Shanali also suggested we use i-pads/tablets for patients to try some digital art during their infusions and display their work on the television in the waiting room. As usual in the NHS there is often no time to put these kind of plans into action as the clinical workload grows ever bigger, but I am determined to achieve this…hopefully in 2018! I would like to say a massive Thank you to Shanali for giving us permission to block mount her first edition prints free of charge. We have been asked for more images by patients and the staff – they are loved by all!! 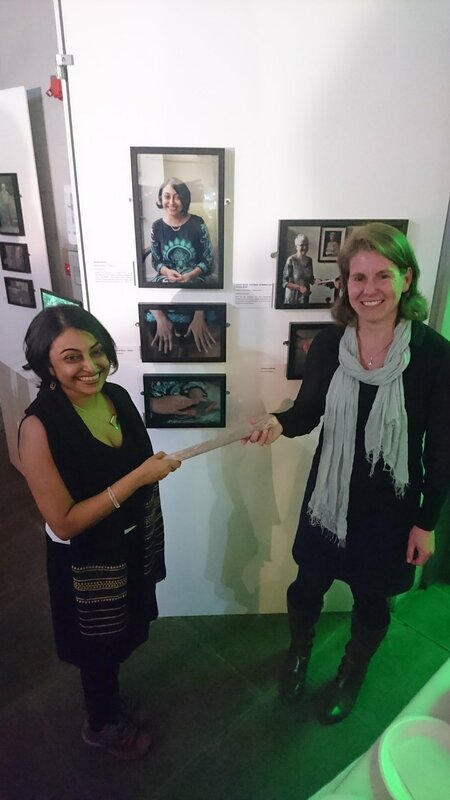 It was a fantastic opportunity to take part in 'Future in your Hands' Photography project organised by NIHR Manchester Biomedical Research Centre | centre for musculoskeletal research. Pics from the exhibition launch at GalleryOldham last evening. What is ‘The Future In Your Hands’? The theme of this year’s World Arthritis Day on 12th October was ‘The Future In Your Hands’, which highlighted how people with musculoskeletal diseases are taking action everyday to live their lives to the fullest. The Centre for Musculoskeletal Research in Manchester wanted to showcase this by taking photographs of people with a musculoskeletal condition performing activities from their daily lives. Hoping to raise awareness of our musculoskeletal community, and show how people in Manchester are living and excelling with musculoskeletal conditions everyday. I had a super day at the "Translating Chronic pain - Moments and fragments" summit organised by University of Lancaster, yesterday. Met some amazing people! And, I was thrilled to to see how a workshop I did last year with the medical Humanities students in Manchester, had inspired one of the students with her fabulous thread work. A personal high. Piece inspired by the wonderful artwork from Shanali Perera. 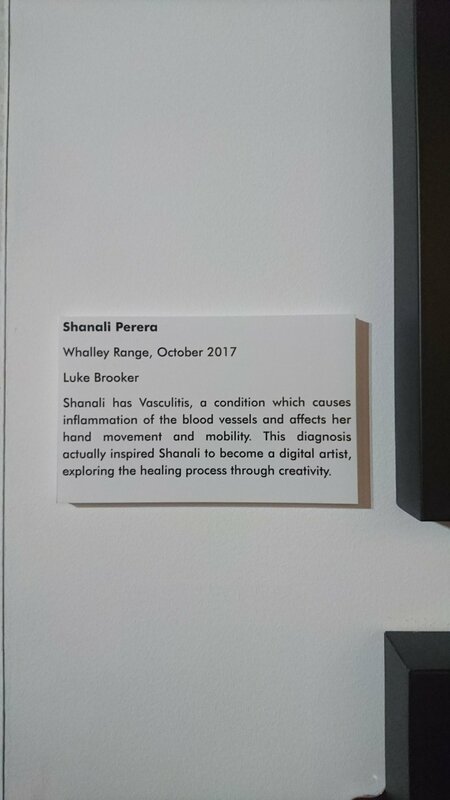 Please check out her important work at http://shanaliperera.wixsite.com/digitalart The piece is constructed from found sounds recorded using contact microphones on my home central heating system (pipes, radiators and boiler). These sounds are then manipulated using audio effects to create a piece empathetic to the artwork. I am a member of a Research User Group (RUG) which is made up of patients and carers who have an active interest in musculoskeletal health attached to the Biomedical Research unit, University of Manchester. It acts as an advisory group for research studies and work with researchers as patient representatives. Patient involvement through advisory groups help researchers consider the patient’s perspective and encourage public engagement in research ideas.